We use an autobomber setup (Abberath's Hooves + Inpulsa) to blow everything up and generate flask charges as we walk. We use haste and phase run to move faster because hooves does AOE damage every time we take a step. More movement speed = more DPS. We use Curse on Hit (which works on hoove's stomp) and heralds to apply: Flammability, Elemental Weakness, and most importantly of all, Despair, in order to lower the resistances of the enemies. Just by running we triple curse enemies! This allows our Vaal Righteous fire to get to insane damamge levels, which again, will have infinite uptime and be active 100% of the time. 9k Energy shield, fast, and max resist. 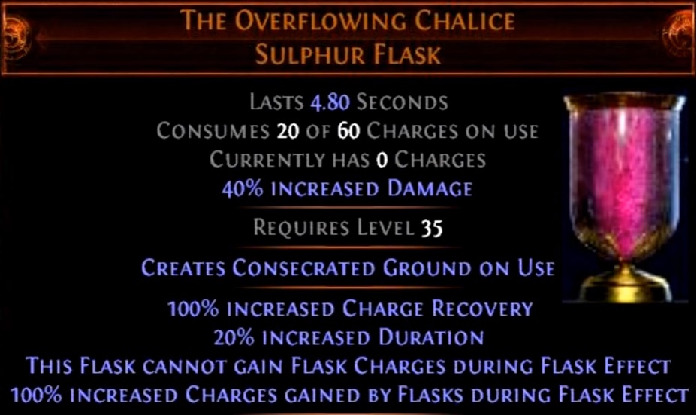 If I'm not an idiot, which I am, we should be able to get infinite uptime on vaal RF by increasing it's duration past that of the flask. 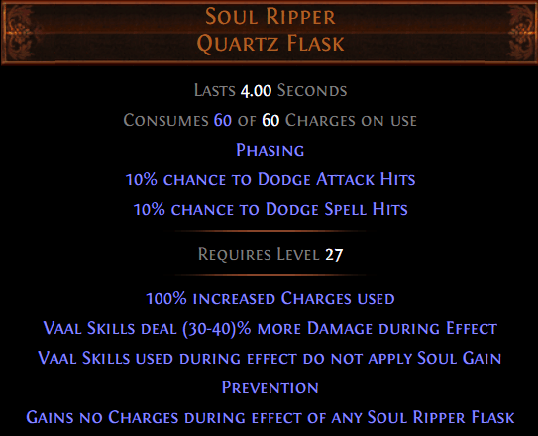 For more charges on soul ripper. Can someone please play this and advise!